Around the time the renowned enlightened master, Rigdzin Jigme Lingpa, built his own monastery west of Lhasa in Central Tibet (Tsering Jong 1764), he instructed his heart-son, Jigme Ngotsar Gyatso, to build the present Kilung Monastery. The search for the precise location in Kham then began and was found through a series of miracles. Construction began around 1770. Rigdzin Jigme Lingpa considered this to be his second monastery, naming it Gonsar Ogmin Rigdzin Pelgyi Ling, gonsar meaning new monastery. Funding for the monastery came from the King and Queen of Derge. The king was primarily Rigdzin Jigme Lingpa’s disciple, and then later transitioned this relationship to Jigme Ngotsar Gyatso, the first Kilung Rinpoche. The omniscient Jigme Lingpa had a vision of the location for the new monastery on a remote mountain in Dzachuka, several months away by horse. Rather than going there physically, he sent a sign to the top of the mountain via mind transmission, and gave instructions to his disciples about how to find it. The sign they sought was Jigme Lingpa’s footprints in stone. The relics are still there today, a source of blessing for pilgrims who make the trek up the mountain behind Kilung Monastery. After the search party’s quest was accomplished, they struck a ritual dagger (phurba, or kilaya) into the mountain, and out gushed a perfect spring of water. The spring is still the main source of water for Kilung Monastery and nearby community—plentiful and cold in summer, never freezing in winter. Over the years, many yogis and yoginis came to this valley to practice, achieving enlightenment and attaining rainbow body there. 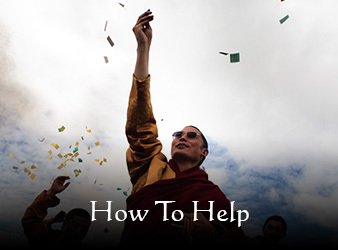 They were drawn by the monastery’s reputation as a source of connection to the practice and deity of Vajrakilaya. 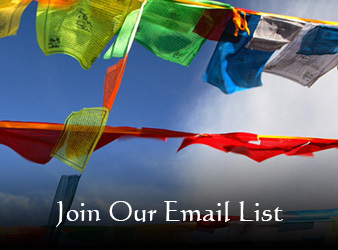 Practitioners of all kinds heard the sound of Vajrakilaya’s mantra on the wind and in the streams. Over time the “ki” in Vajrakilaya was applied to the place: Ki-lung. Lung means valley in Tibetan, so, Kilung means Valley of Vajrakilaya. 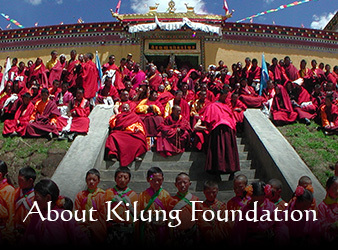 Kilung Monastery became a great center of learning and practice of the Dzogchen-Longchen Nyingtik lineage. The complex included a large temple, monastic college, long-term retreat center, and a rare nunnery, serving a population of 300 monastics. During the excesses of the cultural revolution, most aspects of the monastery were destroyed and the residents fled into hiding. Only the substantial temple and a few houses remained standing. It is this that Kilung Rinpoche has been rebuilding since returning to Kilung Valley in the late 1980s, and from that time, the monastery has gradually been coming to life again. The monastery is also a focal point for Kilung community, and continues to play a prominent role in leading the tribe. For the story on how the original boundaries of the monastery and tribe were restored recently, click here. Other important lamas associated with Kilung Monastery are Lama Lungtok, Mura Tulku, Namkha Senge Rinpoche, and Kandroma Palden Chӧtso. Kilung Nunnery has been a rare center for women practitioners over the last two centuries. This lineage greatly supports women as nuns, yoginis or lay practitioners. The late Lama Lungtok was one modern champion of women practitioners. He trained his daughter from infancy in the Dharma. Kandroma Palden Chӧtso was later recognized as a tulku, and after her father died, became the head of Kilung Nunnery. She is now working with a Thai organization to rebuild the temple and residences of the nunnery in a side valley near Kilung’s main monastery. Mura Mani Wall, a ¾-mile-long shrine to compassion, belongs to Kilung Monastery. The massive wall is stacked with stones hand-carved with Om Mani Peme Hung, the mantra of compassion, and other prayers. It was originally built 200 years ago by one of the disciples of Jigme Ngotsar Gyatso, Mura Tulku Pema Dechen Zangpo. In more recent times it was reconstructed by Lama Lungtok. It is the second-longest mani wall in the world, and was designated as an historical monument by the Sichuan Provincial Government. The Fifth Mura Tulku Rinpoche, Tendzin Khakyab Dorje, started a magnificent restoration in 2007 which continues to this day.